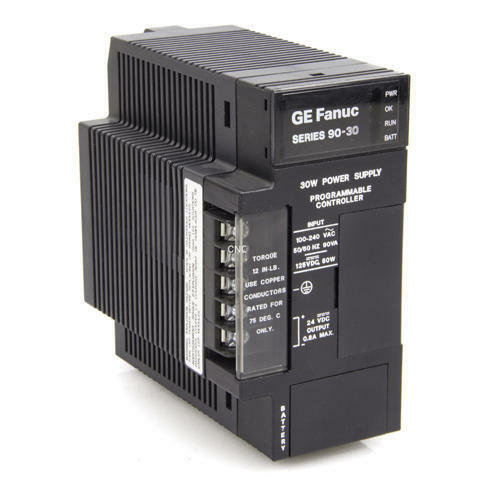 The Series 90-30 PLC is very versatile because, it is programmable and it is assembled from a wide variety of modular, plug-together components. Therefore, by choosing the correct components and developing an appropriate program, the PLC can be used for an almost unlimited variety of applications. Although there are many choices of individual hardware components to use in a system, there are just a few basic categories. Each of these component categories is covered in detail in a separate chapter in this manual. Front cover (shown) or terminal board (for I/O modules). Front cover faceplate or hinged cover for terminal board. Lens cap (some modules do not have). Serial Number - used to determine module warranty status. On some modules, the Serial Number may be on a small tag on the back of the module. We, Aarzoo Traders from 1992 are famous amongst the esteemed wholesaler and trader of an exceptional quality assortment of Electrical Products. Offered products range consists of Electrical Products, Panel Boards, and Cable Wires. Our product range is perfectly designed using contemporary technology in adherence to predefined industrial quality norms. Apart from this, these products are known for their easy to install, lightweight, damage resistance, and sturdy design.